Assistant coach Zac Pearman, right, speaks with Lindenwood pitcher Brody Roach. Pearman graduated from Lindenwood in 2014. 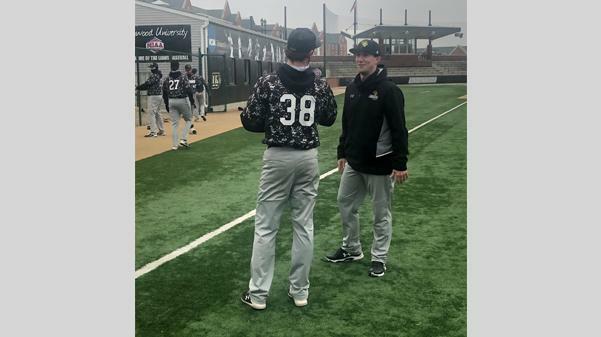 Zac Pearman has been the pitching coach of Lindenwood’s baseball team for three years, and he said coaching has given him the opportunity to continue his passion. For Pearman, baseball is second nature. “One of the many reasons why I wanted to play is because I like to compete, and baseball was something I was good at and had a natural gravitation to it because I hated to lose,” he said. Baseball means a lot to Pearman and his family because he said he probably couldn’t have afforded college without an athletic scholarship. So, because of this he was the first person in his family to graduate from college. Baseball gave him the best opportunity to go to school and get the education he wanted, he said. Outside of baseball, Pearman said he has no hidden talents or weird hobbies. “I am a boring human… I go home and play with my dog and hang out with my wife Natalie and I don’t do much else but recruit and sit behind this desk,” he said. For Pearman, not only is he the associate head coach and the pitching coach, he is also a Lindenwood alumnus. He attended Lindenwood from 2010-2014 and then went on to coach at Southeast Missouri State, where he spent one season before returning to his alma mater. He said his experience at Lindenwood was “awesome.” He said that he met most of his best friends here, and he got to experience a different setting and community from where he grew up in Granite City, Illinois. He said this team has the potential to repeat the success of 2017’s team, which won the MIAAA national championship. The pitching staff, which has a lot of talent, will be a key factor in the outcome, he said. He said his hopes are high going into this weekend’s matchup in Clinton, Mississippi, where they will play four games against the Mississippi College Choctaws. Even though Lindenwood was 1-3 last weekend against Lee University, Pearman said Lindenwood doesn’t need to make a lot of changes because it’s early in the year and the players are getting rid of the rust. Lindenwood scored more runs, had more strikeouts and less walks as a staff. It came down to Lee University being able to do the little things right and handle some situations better, he said. One of the challenges facing the team has been the weather, which has kept players indoors for practice all but two times in the past three weeks. However, as the year goes on, Pearman said he thinks that the team will make tremendous strides riding that wave into conference play.